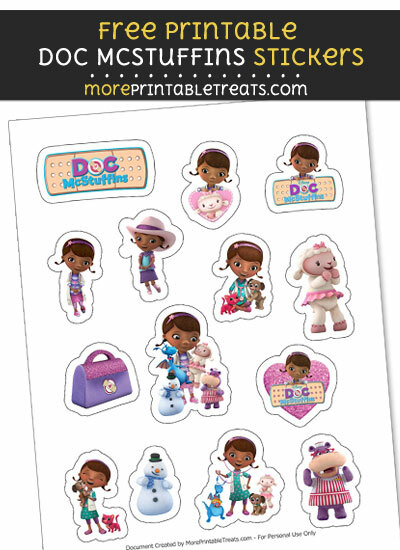 Here is a fun and FREE set of Doc McStuffins printable stickers that you can print to decorate your day planner or to give to kids to decorate their crafts or binders. These stickers are also great to use as rewards in the classroom or at home. There are about eleven Doc McStuffins graphics featured on each sheet with each sticker being around 1 to 3 inches on its longest side. Each of the graphics has a solid color line around it for easy cutting. Note: Copyright and trademark of certain popular graphics belong to their respective companies. I do not own them or claim to. If you would like to share the printable file with a friend, please send them directly to this page so that they can download a copy for themselves. Please do not link directly to the download file. These files are in JPEG form and will download in a zipped folder.